<img border="0" height="320" separator="" src="http://2.bp.blogspot.com/-olhFFIV0eps/URqFJPehYRI/AAAAAAAABr4/3gVDhVFPRa8/s320/Loopy%2Bflowers. 1. Hook in right hand, yarn in left. Make a slipstitch, then 5 chain loops. 2. Pass your hook through the chain furthest from your hook (the one you started with) and pull through. This forms a circle. 3. Chain 1, and pull the stitch on your hook to make a loop. This is your first petal. The following petals should match this size so your flower is even. 4. To make the second petal, pass your hook through the circle and catch the yarn on the other side. Pull through the circle, then catch the yarn over the top and pull through the two stitches held on your needle. Pull this stitch loop out to make a petal. 5. Repeat this move 8-10 times to form the petals of your flower. If a beginner, you might end up picking this apart and throwing it a couple of times, but then it’ll click, promise. 6. 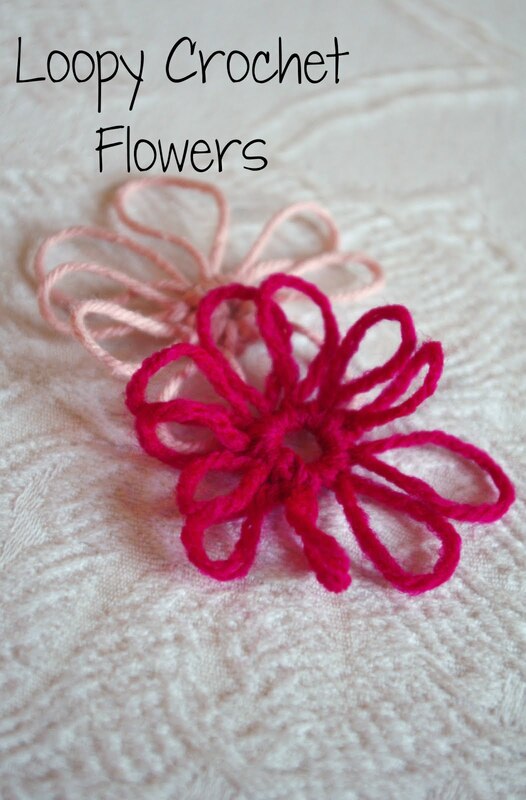 Once you’ve made all your petals and gone around the circle, fasten off by making a small slip stitch into the circle. Work in your loose ends and trim. Press with an iron to flatten if glueing to a card.